In the fishing industry some things stay the same and others are rapidly changing. Every winter I rig a new fishing boat, and it seems every year I’m adding some new technology to my fishing boat. The 2016 Starcraft STX 2050 currently setting in my garage is no exception. New for 2016 both Jake and I are adding “Gateway” to our rigs. Gateway is a shared technology of MotorGuide and Lowrance Electronics that allows our Xi5 Auto-Pilot electric trolling motors to be controlled using the touch screen on our HDS generation three sonar/GPS units. This technology effectively allows the sonar/GPS unit to communicate with the electric motor via standard NMEA cables. The advantage of this system is the boat can be controlled three ways, including the foot control, the Key Fob and now using a Lowrance generation two and three sonar units. The foot control is still my primary means of controlling the electric motor for certain presentations like vertical jigging in rivers, drop shotting for bass and positioning the boat to visual casting targets like docks, weed edges, points, rock piles and submerged wood. 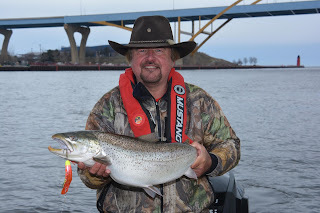 This “old school” means of controlling the boat works as well today as it did decades ago for these common fishing presentations. The Key Fob is handy when following a break-line or meandering shoreline and the need arrises to make occasional adjustments to the boat’s course. I also use the Key Fob a lot when fishing perch, bass, walleye and even lake trout in deep water. I cruise along using the electric motor to cover water and search for fish. The instant I start marking fish, the Anchor mode is pushed on the Key Fob and effectively hovers the boat right over top of those fish. I call this fishing strategy “see fish, catch fish” because it’s amazing how often we can mark fish on the sonar, then use the Anchor mode to position the boat and catch them. 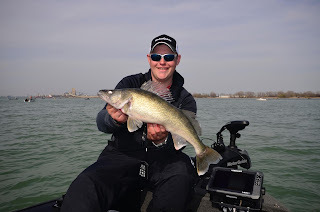 Jigging, drop shotting or still fishing with live bait, it doesn’t matter the Anchor mode on the Xi5 helps me stay on fish better, longer and also to catch more fish. Another useful feature, the Jog setting works well when I’m in Anchor mode. After catching a few fish often the school scatters or moves a little. With the Jog feature I can move the boat in any direction in 5 foot increments. Jogging helps me relocate the school without leaving the Anchor mode. The Gateway connections on my new boat are going to take auto-pilot fishing to a whole new level for Jake and I this year. With Gateway I can navigate to a specific waypoint, create routes and more importantly duplicate those routes time and time again. The Heading Loc feature on the Xi5 essentially sets down a series of waypoints directly in front of the boat helping to keep the boat moving precisely on course. When fish are caught trolling this course, I can duplicate that course and boat trolling speed precisely pass after pass. near bottom at just 1.4 MPH. Gateway also makes it possible to program the Xi5 to run a particular speed. This feature is known as Cruise Control and it enables us to not only duplicate productive trolling runs, but also to match up a trolling speed precisely. For open water trolling we use the Gateway to create highly sophisticated “two motor” trolling runs. A gasoline kicker motor is used to provide our primary forward speed and then the Xi5 is deployed to tweak the speed and also to navigate the boat to known waypoints. The kicker motor gets the nod when trolling with slow presentations like spinners and bottom bouncers for walleye or trolling dodger/Spin n Glo combinations for lake trout. For faster trolling applications, like spoon or crankbait trolling we can actually use the Evinrude G2 for primary power and again use the Xi5 to navigate among boats, line up on known waypoints and create routes that take us across the best fish holding water. Every great fisherman understands the importance of boat control in fishing. With the Xi5 we have at our disposal three distinctively different ways of controlling the boat including old school foot controls, a handy Key Fob and also Gateway a new technology that lets us manage our boat control on the touch screen of our Lowrance HDS sonar/GPS units. New technology can be a scary thing, but the Xi5 is amazingly easy to master. Even and old dog like me has had little trouble getting up to speed both literally and figuratively thanks to the Xi5 and Gateway.